< Can you believe these roses blooming in the middle of December? The neighbor told me she's had roses from the garden on her table for Christmas, and I wasn't sure I believed her. Now I do. If it hadn't been for the freak snowstorm we had, these would have been on my table Christmas day. This mystery rose has been blooming non-stop since June, if you can believe that. Several other roses are also blooming, and there's stragglers on the hydrangeas. This hebe is also throwing off a few blooms, too (Hebe 'Ritt'). ...or this purple ornamental kale. I also love the bright splashes of color in this variegated mourning widow geranium (Geranium phaeum 'Variegatum'). I've been propogating it all over the shady parts of my garden. I was really surprised by the color in this azalea. It was a freebie from a friend who was digging it out. I don't even know what color it blooms yet. But the winter color is lovely. 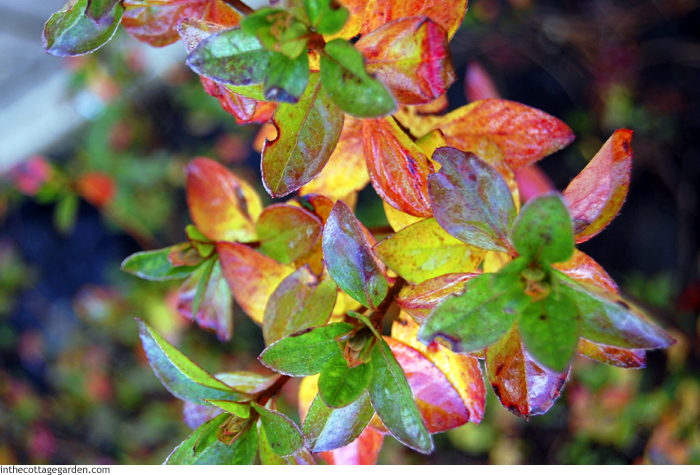 Of course, one of my favorite winter interest plants is cotoneaster, and I brought several with me from the other house. This one, Parney cotoneaster (Cotoneaster lacteus) is great for training onto (or into) a wall, with big leathery leaves and a stunning amount of berries when mature. My PeeGee hydrangea (Hydrangea paniculata 'Grandiflora') has lovely brown mopheads, dried on the plant. 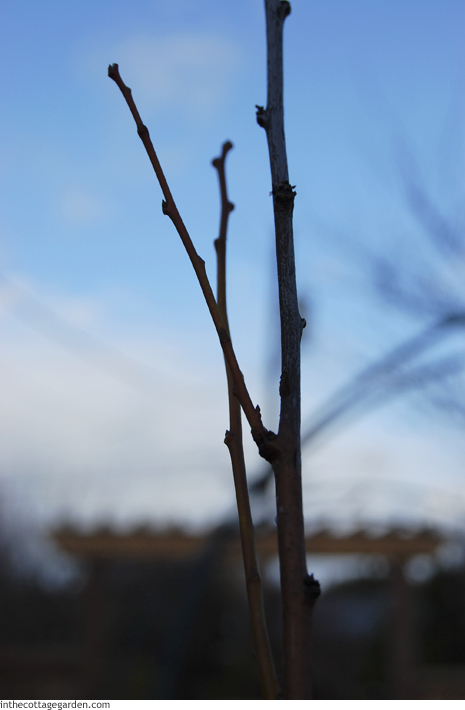 I left them on for interest, so I'll have to be careful when I prune this Spring so I don't lop off the new buds. But speaking of buds, here's my most favorite thing to see this time of year. Buds on the trees. This is a plum tree from my veg garden, and it just makes me so happy! Spring is coming! I know, not for months. What about you? 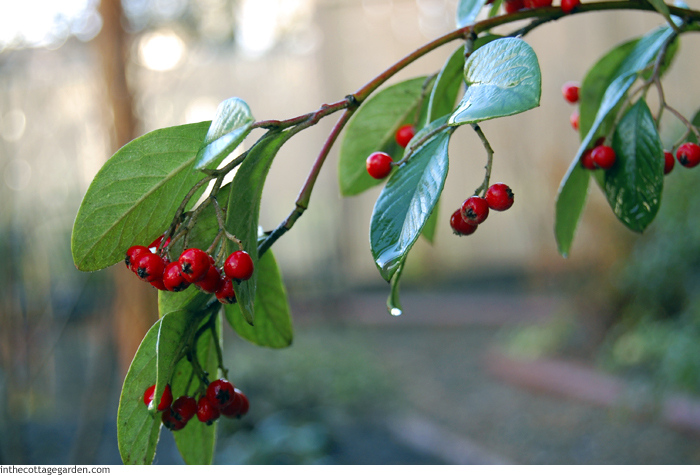 What's your favorite thing to see in your winter garden? This post is a part of the DecemberGarden Bloggers Bloom Day, sponsored each month by May Dreams Gardens.